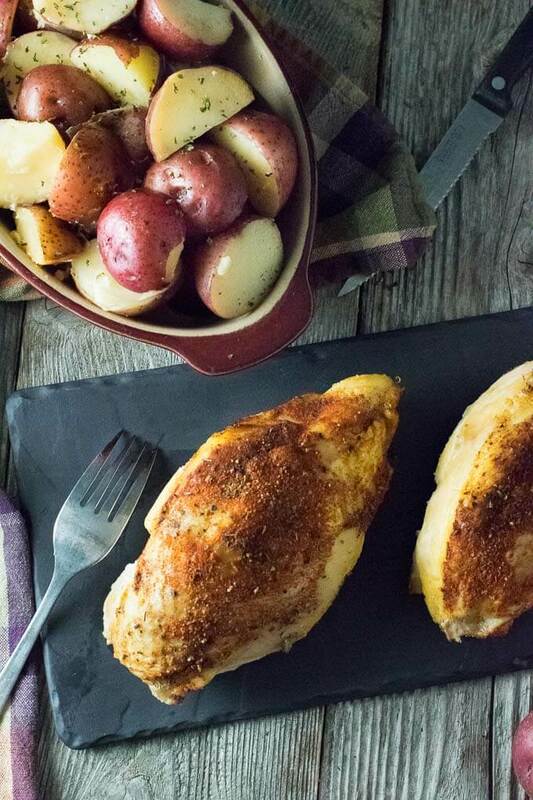 Slow cooker chicken and potatoes is an effortless family dinner. As the chicken cooks to tender perfection the potatoes soak up all of the delicious juices for maximum flavor in each bite! Can you ever have too many chicken recipes? Well, I guess you could be one of those hoarder people I secretly watch on TV as a bit of a guilty pleasure and have a towering pile of chicken recipes tip over and collapse on you. That would be a dumb way to die. Though it would be a bit ironic if a healthy chicken recipe killed you, and who doesn’t like irony? Luckily for me, I store all of my recipes online, so the likelihood of that happening to me is slim. Being on a bit of a chicken kick lately I decided to craft a very simple one-pot chicken dinner that can be created entirely in the slow cooker. What isn’t to like about that? 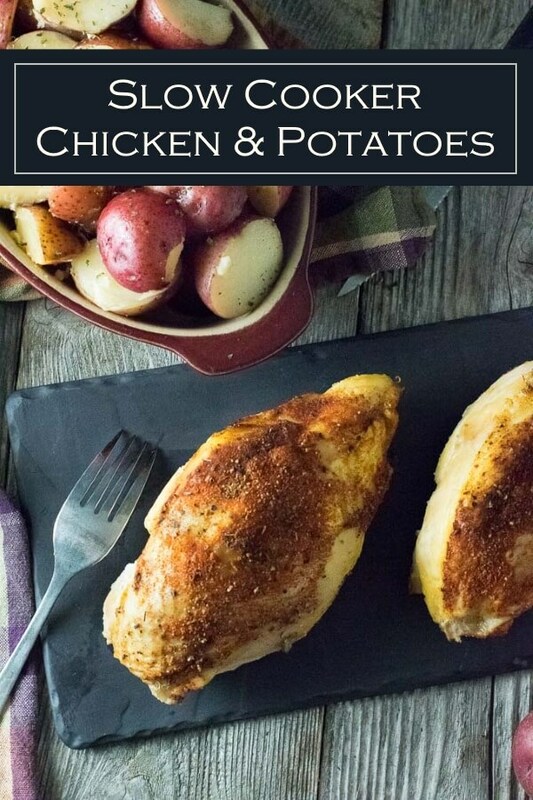 Slow cooker chicken and potatoes is an effortless meal created by cooking chicken and potatoes together in a slow cooker. The key is to lay the potatoes in a single layer at the bottom of the slow cooker and rest the chicken on top of the potatoes. While the chicken cooks it will release juice that will bathe the potatoes, helping them cook and infusing them with flavor. It is important to use chicken pieces with the skin on. The skin contains a lot of flavor that will render out during the cooking process and will help ensure you have enough liquid to properly cook the potatoes. This recipe works best with a 6-quart slow cooker (affiliate link). If you have a different size slow cooker, just adjust the quantities to ensure the potatoes are still in a single layer at the bottom, and the chicken is in a single layer on top of the potatoes. I created this recipe with chicken breasts because I know you guys prefer to cook with chicken breasts whenever possible. The thing you need to keep in mind when cooking chicken breasts in the slow cooker is that once it reaches 165 degrees it will begin to dry out as it overcooks past that temperature. For this reason, if you need to let the slow cooker cook all afternoon, well past the recommended 4 hour cook time, then I recommend using dark meat like chicken thighs instead. Chicken thighs will stand up to being overcooked quite well. Not to mention Slow Cooker Chicken Thighs just taste great! I use my Healthy Chicken Seasoning recipe to season chicken. It is a flavorful blend of paprika, onion and garlic powder, oregano, and cayenne pepper. 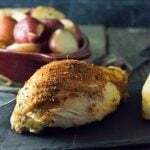 However, this slow cooker chicken and potatoes recipe is versatile and you can substitute your favorite chicken seasoning instead. To substitute, use approximately 1 tablespoon of your favorite salt-free seasoning blend. To give you better control over the flavor I recommend lightly salting the chicken separately. The best potatoes for cooking in the slow cooker are waxy potatoes such as red potatoes or Yukon golds. Baking potatoes are not ideal because they can get mealy and fall apart as they cook past perfection. Ensure your potato pieces are smaller than a golf ball, cutting any larger pieces in half as needed. 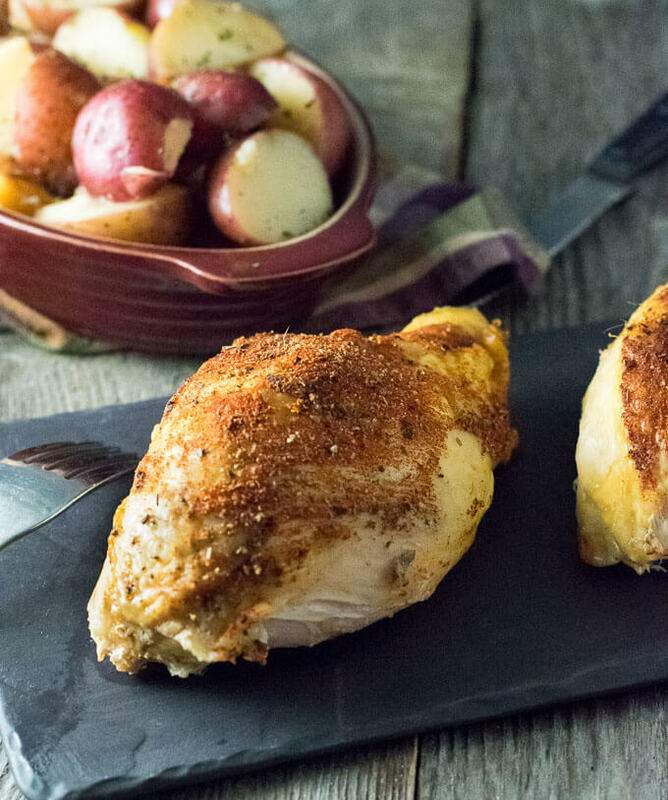 Slow cooker chicken and potatoes is an effortless family dinner. As the chicken cooks to tender perfection the potatoes soak up the flavorful juice. Add potatoes in a single layer at the bottom of a 6 quart slow cooker and sprinkle with salt. Place chicken on top of the potatoes in a single layer, skin side up and sprinkle lightly with salt. Mix remaining seasonings in a dish and then sprinkle over chicken. Set slow cooker to low and cook for 4 hours, or until chicken reaches 165 degrees. Chicken breast can get dry if overcooked, however dark meat, such as thighs work well when cooked longer in the slow cooker and can be substituted in this recipe. IF YOU LIKED THIS RECIPE check out my Crock Pot Hawaiian Chicken Sandwiches. 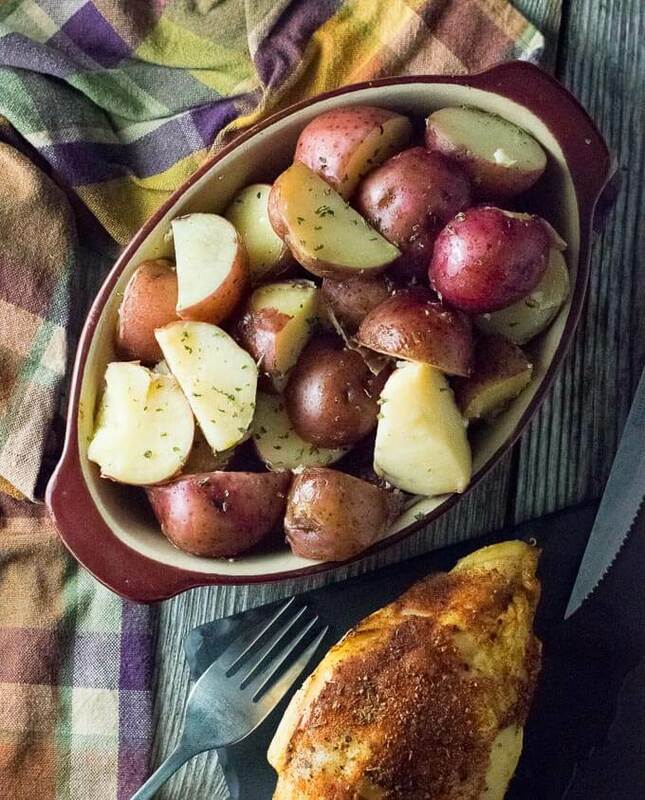 If you enjoyed reading my Slow Cooker Chicken and Potatoes recipe then you should probably like me on Facebook and follow me on Pinterest too. That’s what I would do at least, because if you don’t get to know me but you still use my recipe it is kind of like taking candy from a stranger, and your mom taught you not to do that. Don’t disobey your mom, subscribe to Fox Valley Foodie today!